Common is dead, long live Common. The old Common is no more. Yeah, it was a little beat up around the edges, but what gives? I liked the fact that the walls looked like a bizarro comic book. I liked the booths. I liked the day-to-night menu of casual eats and, sometimes, root beer. The whole thing was as comfortable as an old pair of jeans, dammit. But earlier this year Common decided it wanted more out of life. Common looked around and realised it was time to grow up. Why? I have my theories. There's money to be made on Edge Street now. Whatever's at street level and isn't being turned into a speciality tequila bar or a cafe hawking £5 goji-guava detox shots is (or will soon be) a restaurant, because this is where people want to part with their leisure money. Say you found yourself in possession of a bar and restaurant unit smack bang in the middle of this. Wouldn't you raise your game and go for the kind of customers who aren't going to spend 3 hours hogging a table with their laptop and a couple of Americanos? I would. Anyhoo, when the newspapers came off the windows there was a more foodily ambitious menu. There was table service, FFS. And decorating. Out with the loungetastic booths, in with wooden stools. Common now has the intentional blankness of interiors in a Saturday magazine supplement (architect duo Isaac and Caroline converted the former Balham Brush Works on a shoestring at just £2.3m) The crockery is covetable, the light fittings unique. It looks great. If it was a new restaurant, I'd probably eat there and like it. It's just, well... why'd they have to do it in Common? Yet look under the surface and there's still some rough in this diamond. The astonishingly strong craft beer roster is still there. The trusty burgers are still there, and it's still a good place to hang out once you get used to it, though the clientele has definitely changed. And, with vastly expanded sub-noon offerings, it's now a solid choice for breakfast and brunch, my favourite two meals of the day. Where to eat is a crucial decision if you're feeling way delicate following a long night; the wrong choice here could bruise your soul. You need somewhere comfortable where they are going to smile and play okay music and feed you nice things and you can pretend you're not in public while reanimating yourself with gallons of coffee beverage. If this is how it is with you, I prescribe Common's cured salmon, asparagus and poached egg bathed in hollandaise on a slice of Trove sourdough; like a cooler Eggs Benedict. One particularly fragile Saturday it sorted me right out. My brunch buddy went for small plates from the lunch/dinner menu which I guess is something people do, but he spent the meal looking longingly at my eggs. Another weekend, in slightly sounder fettle, I tried the shak shuka, a skillet of eggs baked in a sweetly piquant mixture of spiced tomatoes and peppers, accompanied by more of that heroic sourdough, and was glad I did. My companion's Full English received cautious approval. Yes, the portions weren't as big as you get elsewhere, and no black pudding, but the impeccable quality of each individual component got it a thumbs up. We ate in the front bit not the dining room and we both appreciated eating in a space light and airy enough to nudge us into the idea of daytime. They had the papers in, too. Oh. Wait. We need to talk about doughnuts. Common has unexpectedly started cranking out the most incredible doughnuts right there in their basement kitchens. They fill them with all sorts of stuff like banana custard or vanilla and plum jam or (gasp) ice cream down there. Those who want to try them should get there early as they regularly sell out. If you're the kind of person who likes that sort of thing, you may flip out and want to bulk buy them and you can do this easily because they sell them by the dozen and half dozen, pre-order only. They are really freaking fantastic doughnuts and you will pay £18 for a dozen. Yes, £18. 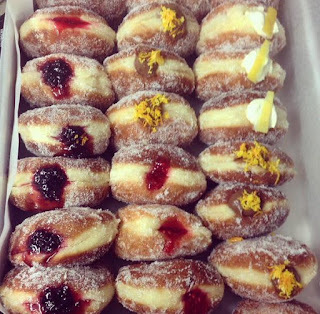 That's only £1.50 a doughnut, which, well... I dunno, I suppose it's all about your priorities. Some people in those Saturday magazines pay £60 for a single lipstick (!!!!) Is it wrong? Is it right? I donut know. Common, 39-41 Edge St. Northern 1/4, Manchester M4 1HW. Breakfast menu served 10am-2pm daily. Full disclosure: Common asked me to come in and have a meal on them and write a review. For this post I went once on their dime and once on my own. And they're not giving me free doughnuts. Though, you know, I wouldn't say no to one.